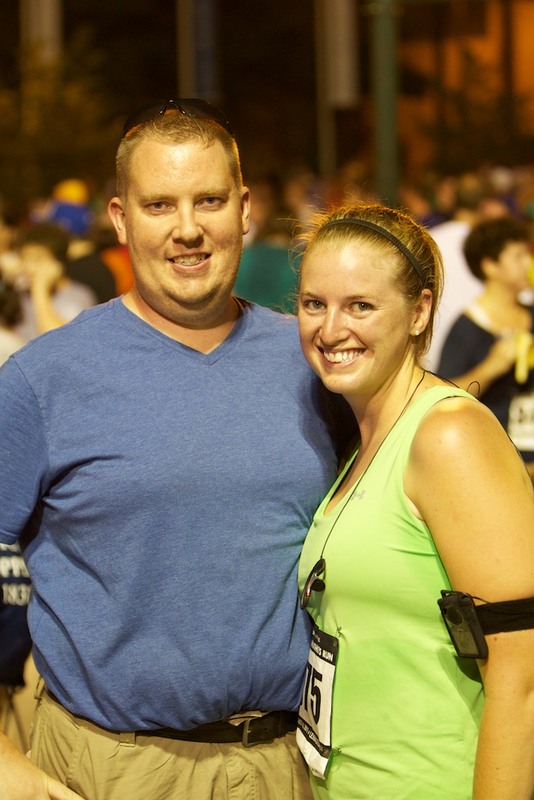 A couple of weeks ago I finished my third half marathon–the Bourbon Derby. I thought I was crazy signing up for a half marathon in Central Kentucky in the middle of June, but it actually turned out to be a gorgeous Saturday morning. It wasn’t too humid and it wasn’t too hot when the gun went off at 7:30 am. The course wound around side roads and horse farms around Paris. The start/finish line was at the Bourbon Drive-In, which allowed for parking and room to warm up. There were only a few times that some cars drove through the course, but they were great about driving slow and waiting for runners to move to the side. 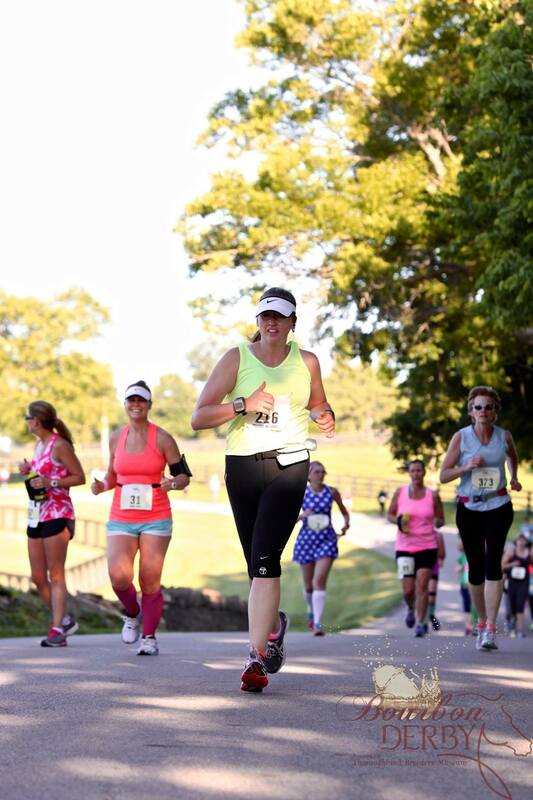 The race had a four-mile and 10-mile course option along with the half marathon, and each race got to run around at least one horse farm. The half marathon wound around Hillcrest and Adena Springs. If you want to talk about gorgeous scenery, along with some wicked hills, those horse farms had it! The entire course was rolling hills, with one particular hill that I swear if you leaned forward a little too much, you’d smack your nose on the asphalt. I went into the race not expecting to get a personal record, since I hadn’t been able to train as well as I had. I wanted to stick to around a 10 minute mile. To my surprise, I finished the race with a new PR by two minutes from the Run the Bluegrass Half Marathon last year! My official time was 2:06:49! Everyone’s GPS devices were a little screwy with this race–my Garmin said it was only 12.66 miles long, but the Bourbon Derby course was certified. There has been a lot of discussion about the distance of the race, but I know that not all GPS devices are reliable. There was a thought that maybe a turnaround was misplaced on one of the horse farms, which could make a difference. If that’s the case, then my PR doesn’t hold, which would be a big bummer. I pushed through and ran for the first seven miles, feeling strong and comfortable. After some step inclines around the farms, I’d walk at the top to catch my breath, then started running again. Do I look like I’m running strong? For a first-time race, this was very well organized. The announcer/DJ was great–he kept cheering everyone on through the last runner. There were plenty of hydration stops along the routes, and the offerings for after the race were plentiful. I hope I don’t sound petty, but I was bummed about the menial medals, but maybe I’ve just been spoiled with the previous races. I felt great after the race–I cooled down while cheering on the rest of the finishers. 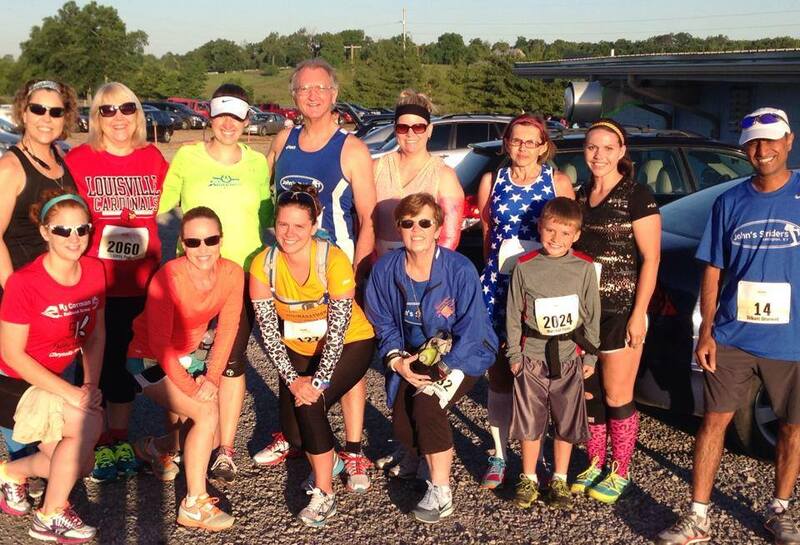 I loved being able to meet up with the Striders, my running group, to cheer on and discuss the race before and after. If you haven’t joined a running group, I totally recommend it. John’s Striders ready to tackle the Bourbon Derby! Will I run this race again next year? I think so! I don’t know if I’ll be so lucky with the weather again like we were this year, but the course was pretty shaded by lots of trees along the way, so that was a big help. Your turn: Tell me about your most recent race! Run/walk 70 miles. Oh yeah, finally rocked this goal!! 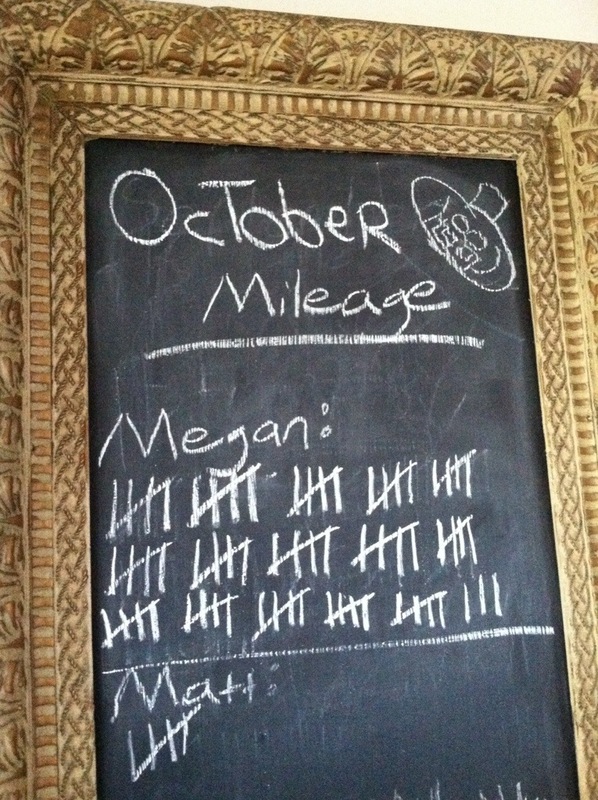 The total ended up being 78 miles! It might have been walking than running, but I’m OK with that. Continue to work on my kipping pull-ups. I wasn’t as successful as I’d like to admit. I did work on kips a few days here and there, especially with doing toes to bar, but I really need to be more serious about it. If I want to compete at a CrossFit competition soon, I have to be able to do unassisted pull-ups, which means I need to kip! Plank A Day. I didn’t do a plank everyday, but I made sure I did one at least a few times a week, and holding them for at least 90 seconds at a time. It made me more aware that I need to do more core strengthening on top of my running and CrossFit workouts, so I think that’s an accomplishment. Re-work/Re-design my blog a little bit. Well, this one everyone can see–I did at least redo my header–what do you think? I’m stuck on how else I should change things, so I need your help. What do you think would make my blog more attractive and more inviting for you to read? * New front squat (130) and clean (110) PRs set at CrossFit! * M and I celebrated our 1 year wedding anniversary and my mom and dad celebrated their 40th! I need to finalize my November goals, but I don’t want to keep repeating what I have up here. Hopefully in the next day or so I’ll be able to post them for you. Your turn: How did October go for you? Any big accomplishments to celebrate? Brag about it!! Meet my September deadline early, and then get a good head start on my October article deadline. OK, so I wasn’t the best at deadlines this month. I did meet my September deadline a little earlier than the actual day of, but I’m still working on my October deadline (which is due next weekend), so I’m not working as far ahead as I would have liked. Gotta do better at deadlines! Take my women’s multi-vitamin everyday. I’ve been rocking this one! Get in at least 70 miles of walking this month. Unfortunately I only reached about 65 miles of running/walking in September. If I hadn’t gotten hurt last week, I was going to do a 5 mile run on Wednesday, which would have definitely helped me meet my goal. Oh well. I will repeat this goal for October! Keep a positive attitude and try to not let things get to me as much as I have lately. Things have started to look up for me lately, so I’m going to say this was a success! This is always going to be an ongoing goal, though. Work on my kipping pull-ups everyday I’m at the box. Total fail at this one. After I ripped open my hand a couple of weeks ago, I’ve had to take it easy on hanging off of things. So I’ll be working on this, still, and that’s OK! So I was 50% for the month–that’s OK, I still made some big strides with everything, so I have to be happy with that, right? Your turn: How’d you do for your September goals? Ready for October? * Run in a few more races and work to continue PRing — I actually didn’t run in very many races in 2012, except for the major ones (Derby Half Marathon, Bluegrass 10K) and the obstacle races, but I’d like to do a few more 5Ks and maybe a second 10K. * Continue to find/create health recipes — I’m trying to embrace being an “adventurous cook” by taking recipes and trying to make them a little healthier. * Eat out less — This will just save us more money and more calories in the long run. * Do my best to avoid sugar rushes — I’ve got to break the sugar craving I’ve had lately. * Try to get M to make healthier food choices — They say the best way to create change is be the change…let’s see how this goes. * Work with M more on setting budgets — We’ve talked about it, but now’s the time to really do it, with M still trying to find a job. * Sock away freelance cash — Continue to grow the savings account with the freelance jobs. * Really sit down and think about my career — It’s not that I’m miserably unhappy in my job. I’m happy in my job, but I don’t know if I see it as the exact fit for me. I feel like I’m at a crossroads, yet again, and I need to really figure life out. What’s ironic is right now M and I have the perfect opportunity to pack and move wherever a job would take either of us, but we’re afraid of big changes and moving. * Reconsider personal training certification? — A few years ago, I was all set to start studying for my personal training certification, and then some big changes came to my full-time job and I had to put that on hold. There’s a part of me that still wants to be a personal trainer, but I’m not sure if my life can fit that in right now. * Grow this blog — I’ve really enjoyed blogging the past year, but I’d like to grow it more in many ways; perhaps by joining blogging groups like FitFluential, or anything. 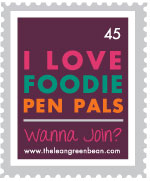 I love the healthy blogging community that I have been lucky enough to be a part of. Shew…that’s a lot!! Better get started! 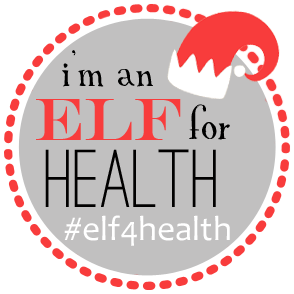 This is the last week for the Elf4Health Challenge. 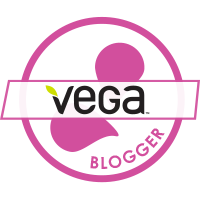 It’s been a fun six weeks and I’ve enjoyed getting to know new bloggers. I have to give a huge shootout and thanks to Elle and Lindsay for putting this together–I don’t know how they do it! Monday, Dec. 31 — Make a healthy dish to bring to your New Year’s celebrations. We’ll be traveling to spend the night with a good friend of M’s (he was one of our groomsmen) in Dayton, so I’m not too sure what I’ll do about this challenge. I’m sure I’ll come up with something, and when I do, I’ll share it with y’all! Tuesday, Jan. 1 — Clean the house from top to bottom. Again, we’ll be in Ohio for most of the day, but I already got a headstart on cleaning on Sunday–even cleaning out some of the cabinets again. This will be an ongoing project through the week. Wednesday, Jan. 2 — Set a fitness goal. Done already–I want to complete my second half marathon, and try to get in a few more races in 2013. Thursday, Jan. 3 — Eat at least three food groups at each meal today. This should be fun! I’m already picturing my scrambled eggs with a piece of whole wheat toast and a banana for my breakfast, and endless possibilities for lunch and dinner. Friday, Jan. 4 — Walk or run a mile as fast as you can! I’m going to be at a dog agility seminar Friday and Saturday, so I’ll be doing this challenge earlier in the week. I’m excited about this and about pushing myself. It’ll be interesting to see how I do pushing myself in the cold air. Saturday, Jan. 5 — Get up and move during the commercial breaks while watching TV. I’ll be at the seminar most of the day, but I’m going to try to do this throughout the week–a great idea for everyone to try! So there you have it…one last week as an Elf for Health! I hope this inspires more people to try new things like this challenge has inspired me! Last week I started the inaugural weekly goal post because I wanted to be held accountable for making better/healthier choices and be proud of how I’ve done because everyone who reads this blog can keep me honest. Drink more water: I did very well with this, drinking at least three water bottles’ full everyday, for at least the recommended two liters. Chill on snacks: I did decent with this one, until towards the end of the week when I was exhausted and just craving carbs (i.e., Baby Swiss Cheezits in my co-worker’s desk) like crazy. Run and stretch more: I did my yoga DVDs twice last week, which was great, and I ran three times on the treadmill, adding more stretching at the end of my runs than I had. Decide on what half-marathon training program I’m going to go with and then design it to fit my schedule and my ability, then start and stick to it! I officially start my 12-week half-marathon training program a week from today, so I’m already starting to get nervous, as I previously shared. I just want to be able to be on the right track so I can get through the 13.1 miles without injury and around 2:20. Last week’s workouts consisted running on the treadmill, weight and circuit training on my own, two yoga DVD workouts, plus quite a few walks (some running, especially in grass and up hills) with the dogs for their conditioning. Another Monday means another week to do better! January is halfway complete, so it makes me think of those who made that annual resolution to join a gym and get healthy. How successful have they been? 1.) If you don’t know how a machine works, ask! I don’t mind pausing to show someone how to get the best use of the machine. You don’t want to hurt yourself before you get started. 2.) Don’t sit and dawdle on the machines or benches. I’m always on a time limit. I don’t want to wait to do a 30-second exercise. 3.) Leave your phone in the car or in your gym bag–it doesn’t belong on the elliptical or on the weight room benches. Once again, my time is precious. I also appreciate my time being unplugged from technology (minus my MP3 player and the treadmill, of course). Trust me, you will too. 4.) Don’t be afraid to park farther away from the front door. It’s not Christmas. You don’t need to stalk me for a close parking spot. (I park my truck towards the back of the lot, anyway.) You’re here to workout and burn calories. Start that process by walking a few more steps. 5.) Stick with it! Don’t get discouraged if the scale isn’t moving as quickly as you’d like. A change in your health takes a long time. Be proud of every minute you spend in the gym, sweating away your stress, sadness, lunch, etc. Any little bit helps! I celebrate March as being free from the resolutioners because they usually slack off by then, or they’ve morphed into a regular, like me. This year I hope to see more regulars at the gym. What other tips would you share with a resolutionist at your gym?